Pandora Hearts Wallpaper: . :What's Left of Broken Hearts:. 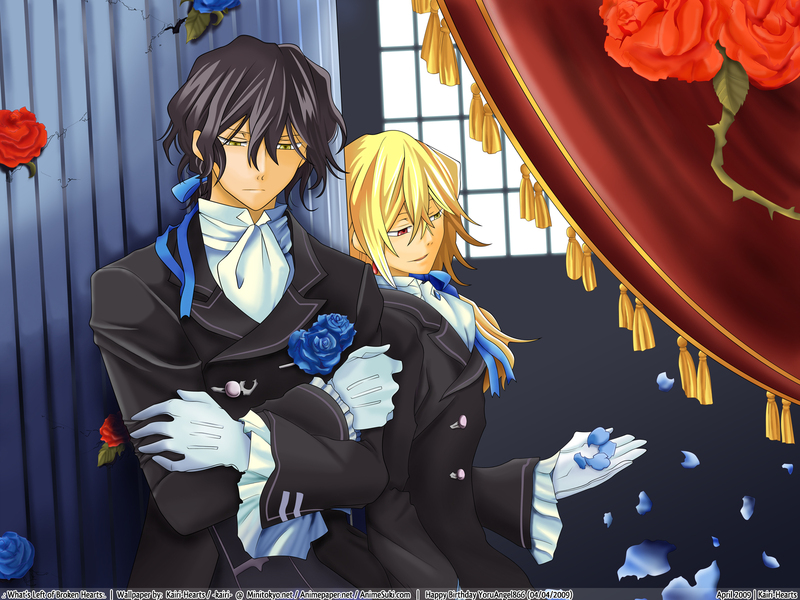 Minitokyo »	Pandora Hearts Wallpapers » Pandora Hearts Wallpaper: . :What's Left of Broken Hearts:. Oof….finally finished it (kinda). You see, I started vectoring the image months ago, but only finished Break and half of Oz. Then I took a break for months and months and finished Oz, then Raven and stopped…again! And when I found out Yoru-chan loved PH too I told her I was making this and she asked me to finish it before ph anime started. The lines are thin, I know. Also used colored lines in some parts. As usual, curtains were troublesome. The curtains and that pillar are what I hate the most. They just didn’t come out as I planned! Arghh! Time: I don't remember how much I took for the outlines since it was long ago... The painting was around 7hrs. More Resolutions...if anyone asks for them. i love your vector and your painting is mazing! I never thoughht someone would do this! Hot guys & awesome bg = amazing scene! I didn't got to comment cause I was in such a hurry. Pandora Hearts has such beautiful graphic. I like the hair, I see you used gradients and lots of different colors, at least for the blonde guy XD It looks lovely, next are the blue roses on his coat, nice detail&shades on them, also the shades on the shirt? it's a shirt right? -_-' and the coat thing, great job on those too, the curtain looks also very good, it has a nice flow in the shades. And lastly the pillar, great painting on it too, thou the space between the lines are not even everywhere, it still looks good. Plus, and I'll stop -_-;; great choice & crop of the scan, I like the melancholic feeling it gives. ok i think this is definitely one of your best works in terms of coloring. you really brought out the richness of the indoor scene that i KNEW you could but its stamped all over with your signature painting style. its absolutely gorgeous! I absolutely like the roses, they're very beautiful and the painting is fabulous. The coloring is pretty good, I like the mix between the solid coloring and the soft painting. Still there's something bothering me a lot. The outlines. They look blurry and I feel they're too thin. I'd try making them thicker for the next time. The cracks are weird. The spaces below the window is a bit empty too. It came out great. Lovely painting and the vectored hair looks awsome. Yeah, the frills... still don't know if they did it on purpose, but still... it didn't seem right with frills on one sleeve only. Love the roses, they're great, and as i said before, your painting skills are getting better and better. Keep up with the good work. This is gorgeous, and I love the other version too! Very nice indeed! I love it! They are so hot...esp with the blue roses..
Do you have the wallpaper in 1920x1200 by any chance? If so, can you post? Thanks in advance! Gorgeous wall as always with you. The colours are great, vectoring great, and painting inspirational as always. The roses are just something else though. Especially the ones on the dark-haired guy's jacket. Keep up the good work, I don't know how you do it!